Who is Scenic City Chorus? 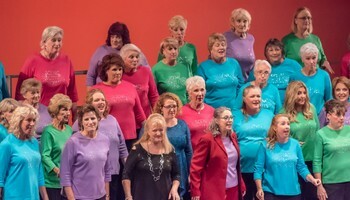 Scenic City Chorus is based in Chattanooga, and our 60+ members of all ages come from eastern Tennessee, northeastern Alabama, and northwestern Georgia. A wide variety of backgrounds and lifestyles are represented among us, but together we share a common bond through music and performance. Scenic City Chorus has a mission to bring its unique sound to the community through performance. We also offer education in the barbershop craft and performance opportunities to young women between the ages of 14 and 25 through the Young Women in Harmony program. In addition to an annual show with featured guests and our Christmas show, we are available for hire in full chorus, small ensemble and quartet configurations. If you’re looking for unique musical entertainment, check out our See & Hear menu where you will also find hiring information. Many of our members are musically trained or have music degrees. But the unique sound produced by barbershop harmony is dependent on several factors not always found in traditional music training. 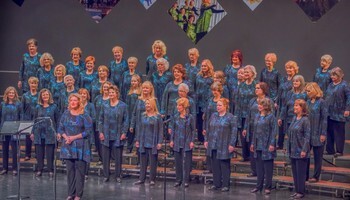 Scenic City Chorus is a part of Sweet Adelines International Inc. (SA), a nonprofit organization whose mission is to preserve the American craft of barbershop. SA offers musical training aimed at honing the unique skills needed for this type of four-part, a cappella harmony. Vocal and music theory instruction is ongoing, as well as coaching from certified experts throughout the year. Each spring, Scenic City Chorus competes in SA's Regional Chorus Competition. After working the craft for months to bring our best performance on stage, we compete against other choruses in our size-based division. It's an important time to get constructive feedback from a panel of judges certified in the barbershop craft. Regional division winners go on to compete internationally. Scenic City Chorus consistently medals regionally, this year coming in second in our division and third overall out of 19 competing choruses. The Sweet Adelines organization has approximately 20,000+ members in choruses and quartets worldwide. Scenic City is a non-profit charitable organization as described under the Internal Revenue Code, Section 501(c)(3). Your donation serves to strengthen our program and our mission to spread harmony throughout the Chattanooga area and to educate youth about the joys of our uniquely American art form. We deeply appreciate your consideration of us as a recipient of your financial support. Purchase tickets to our shows online! Want Scenic City Chorus to sing at your next function? Why not hire Scenic City Chorus to entertain at your next event? We can perform at corporate functions, charity events, community Entertainment events, birthday parties, christmas parties, awards nights, weddings, engagements, anniversaries, engagements, and even funerals and memorial services.